The new year is approaching quickly. Now is a time to look back at the past twelve months and appreciate all that was good and learn lessons from the bad in order to switch out bad habits for good. Changing habits is extremely difficult, so take advantage of the New Year to motivate you into making some healthy resolutions. Read on for some simple tips to get you started on your resolutions and to come back to when the going gets tough later in the year. If you’re serious about starting 2017 in a healthier way, then take the setting of your resolutions seriously. Meditate on what your change will be. Sit in silence and bring your mind to focus on what would really serve you best. If you already have a yoga practice, then do this thinking after a strong yoga asana practice when your mind is clear of all of it’s normal, monkey-mind clutter. If meditating is not your thing (yet, maybe a goal for 2017?) then do a simple brain storm on paper to discover what change will be best for you in the coming year. Once you have your goal in mind then be brave and share it with someone. It might feel vulnerable to do so, but by sharing your change with a friend or family member you will begin to turn the wheels on your new habit. Having someone else know about your goal will motivate you to put it into action, if you tell someone and it never materializes, then you might feel embarrassed about not pulling through with your commitment. The person who you inform can also act as a motivator by asking about your progress now and again. Plus, you never know, maybe your friend has been wanting to make the same changes in their life and you could be the nudge they needed to take the plunge. Two people tackling a new healthy habit together are much more likely to succeed than just one. Changing habits is tough, to make things easier on yourself start small. Let’s use yoga as an example. If your yoga practice has ebbed and flowed, being strong and nonexistent in 2016 and your goal for the new year is to get a consistent, strong practice back, then start small. The long-term goal might be to practice for an hour, 5x /week, but that is a major change in your schedule to begin on January 1st. Be more realistic by starting small. Instead of trying to do an hour practice every day, start by making the time in your schedule to do 20 or 30 minute practices a few times a week. It will be easier on your body and on your ego, for if you start big and fail, then you may not get the energy to try again later in the year. And by starting small you can gradually build up to your bigger goal. I hope these simple tips can get you excited to make change for the better for your health and yourself in 2016. Whether you want to increase your practice, get your arm balances down, or give up carbs, meditating on your change, sharing it, and starting small will help you achieve your end result. Have a safe, happy, and healthy New Year! Join me for a Flow into the New Year yoga workshop in Jamestown, NY on Saturday, December 31st from 2-4 pm. For more details follow the sidebar link to Kara Bemis Yoga Facebook page. 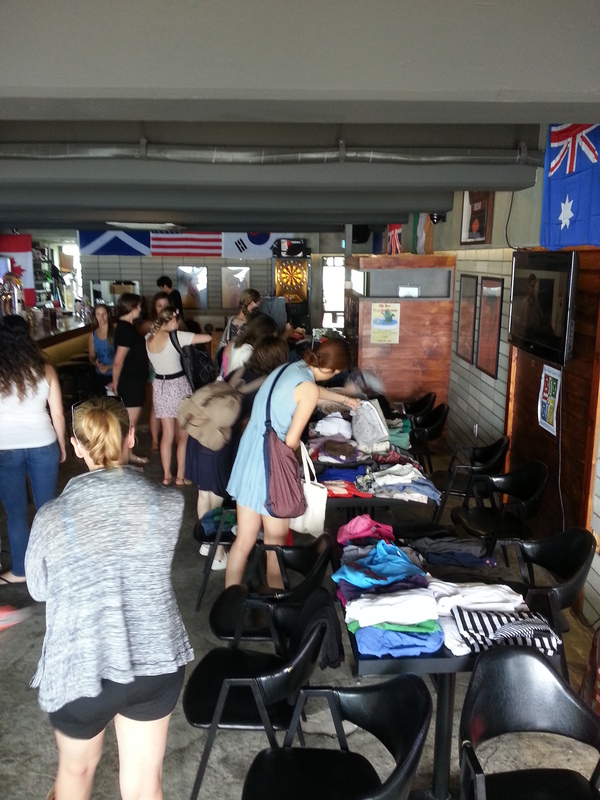 This past weekend I hosted my third community clothing swap here in Busan. The idea was exactly the same as the last two that I’ve hosted, all are welcome, donate what you can or come empty handed, walk away with as much as you like. The reasons why I don’t require donations by all are: 1. 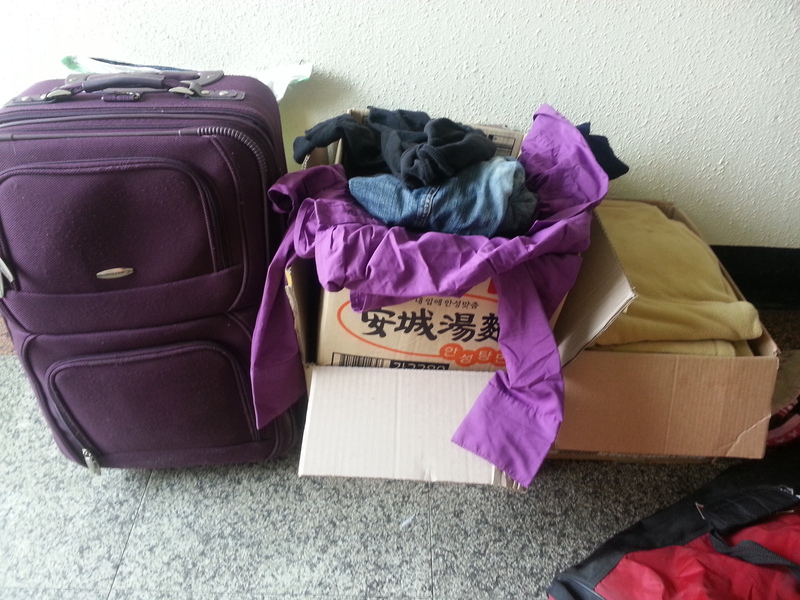 There’s an excess of clothing left behind by expat teachers whom have moved on from Korea and 2. My hope is that people will find clothing through this sustainable manner rather than by supporting Fast Fashion. Although this swap was very similar to my past two, there were a few minor differences I made after learning some lessons from the previous ones. Here’s what was different. About half of what was left over from the swap. At the last swap I got swamped with left over donations. A handful of friends and I took hours to sort through the piles and piles of clothes, placing them in either a massive garbage bag (we filled three,) a bag to be taken to a second hand shop (there were about 10,) or a pile to be sold at a market. This time I asked that people bring only high quality, no stains, no intimates. Initially I had faith that an outline like that wouldn’t be needed, but I turned out to be wrong. At this swap the clothes were in nicer condition and there weren’t as many to sort through in the end. Change of Venue – The cafe where my first two swaps were held has sadly since shut down, so I moved location to a foreign-run bar in Gwangan – HQ. It was fun to have the swap at a bar. When I contacted them I referenced having a girls brunch day and they complied with a mimosa special during the time of the swap. Just like the last two swaps, purchase of a drink was suggested in lieu of an entrance fee. Sneak Attack Ethics Lecture – Ok, so that might be misleading, but I did give a short five minute talk about my reasons for hosting swaps. At the very first swap I incorporated a talk about the fashion industry and sustainability (or rather lack of sustainability) which was scheduled to happen right before the swap began. A few people attended and were interested, but a lot of people didn’t come early for it, so this time I didn’t tell anyone I was going to do it, I just requested a mic from the bar and stood on my soap box at the height of the swap. I’m not sure how well received it was, but I hope that I reached a few people. Swaps are really fun and easy to organize. I received a lot of feedback from attendees that they enjoy them and look forward to the next one. I hope they realize that they don’t have to wait for a large community swap to be organized; it would be super easy to host seasonal swaps with friends in your home. All you need to do is set a date, inform others, dig a bit through your closet, and swap till you drop. Last Sunday, July 12, 2015, was a turbulent day of wind and rain brought to Busan by tropical storm Chan-hom. There had been talk of a typhoon making it’s way to us, but it settled down into a tropical storm. Winds were high and the rain went from heavy to light throughout the day. This article on weather.com, states that winds were recorded as high as 47mph here in Korea. Although it was not an ideal day for a bike ride, that’s exactly what I did during a period when the rain wasn’t so heavy. We took the boardwalk path on the way back to my apartment and were shocked by how much trash had washed up on the beach from the winds and surf. I snapped a few pictures, but most of the photos in this post are from early Monday morning, the following day. This amount of trash on the beach is extreme; there is always litter, casually dropped by beach walkers (cigarette cellophane, lighters, candy wrappers, straws, coffee cups, etc.) but the storm brought a whole array of trash. Things that I noticed were shoes, balls, a lot of plastic drain filters, plastic beverage containers (water, soju, makgoli,) styrofoam and so on. There were great big styrofoam buoys, corners and bits from styrofoam coolers, and tiny pieces that had been broken down by the ocean. These little pieces are the ones that threaten the life of birds and fish because they resemble fish eggs so are consumed as food. I noticed that there were still tourists snapping pictures at Gwangali Monday morning, however they were ignoring the length of beach covered in trash and instead aimed their phones at the bridge. I suppose to most people when they see a sight like that they think about how ugly it is and feel no responsibility to it so simply ignore it, but when I saw it, I wondered where was it coming from, how do we stop it, and how many innocent wildlife will die from our waste? As I was taking pictures Monday morning, about half of the beach had already been cleaned up. Busan is great about getting crews out there every morning to make the (tourist) beaches look pristine. While the beautifying of the beach seems beneficial to us all, I can’t help but wonder if habits would change if people’s litter and trash stayed on the beach instead of miraculously disappearing every dawn. Witnessing the debris that was washed up on the shore was depressing but also inspiring for me to question how I can decrease my impact on this finite planet even more. This month there has been a campaign online – Plastic Fee July, take a look at the link of their facebook page where you can get ideas about how to decrease your plastic use. Here’s a previous blog post of mine with tips. We can all do our small bit by carrying reusable bags, refusing bottled water, creating and using DIY cleaning/beauty products and most importantly sharing and inspiring others with our efforts. How are you having a Plastic Free July and Plastic Free Life? Better quality photos taken by Ben Lear. I saw some pigeons picking at and around the trash, I wonder if they possibly ingested any of it by accident. It’s April. This month we celebrate Earth Day, a day to recognize the beauty of nature, maybe plant a tree, spend some time outdoors, or attend a community planned event. That’s all good and great and brings nothing but smiles to my face, but ultimately, we need to spend every day as if it is Earth Day, because every day we live on and take from this planet and rarely do we take a step back and contemplate our day-to-day choices and their effects on the environment. It has been on my mind a great deal these past few months to use less plastic. One of my resolutions for the New Year was to decrease my plastics use this year and forever more. Here are some tips of how I have been cutting back. DON’T USE PLASTIC BAGS!!! These nuisances are almost unavoidable. Purchase anything and they automatically toss it in a plastic bag. This is exceptionally true here in Korea at markets and convenience stores. At least at grocery stores they charge you for the bags (here in Korea.) Give it a think, what use does that bag have to you after you bring it home and take out whatever you carried in it? Maybe you could use it as a garbage can liner, but that’s about it. I’m sure you have a larger collection of plastic bags than you do garbage cans. Replace them with reusable bags that fold up and clip onto your purse, or take an empty backpack with you to the grocery store. I’ve made it a recent habit to even take empty Tupperware with me to fill with shrimp or wet items sold fresh from the market. It works great! PURCHASE WITH LESS PACKAGING Marketers wrap their products in so much unnecessary paper and plastic to make it look appealing on the shelves. Again, this is an example of a one time use by-product that has absolutely no value to you in the future. There’s no doubt that it makes its way into the garbage or recycling bin. While choosing a product at the grocery store or any other shop, compare which item has less packaging and go for that. Give preference to post consumer recycled paper board or soy printed labels. If something comes in a glass jar, then wash it out and add it to your Tupperware cupboard, or use it to store sugar or other dry goods in as opposed to in the plastic bags that they come in. Wash and reuse glass jars after use. 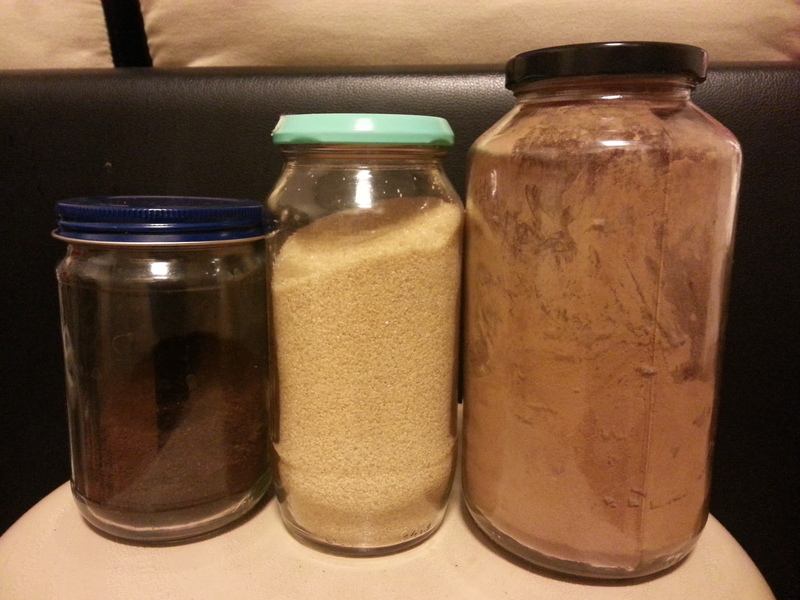 This way, you can store dry goods like coffee and sugar in glass rather than the original plastic. ASK FOR NO STRAW If you get an iced coffee or smoothie or even a soft drink with your meal out at a restaurant, then be sure to tell the server or barista that you do not need a straw. They are absolutely pointless utensils and cause a lot of waste. 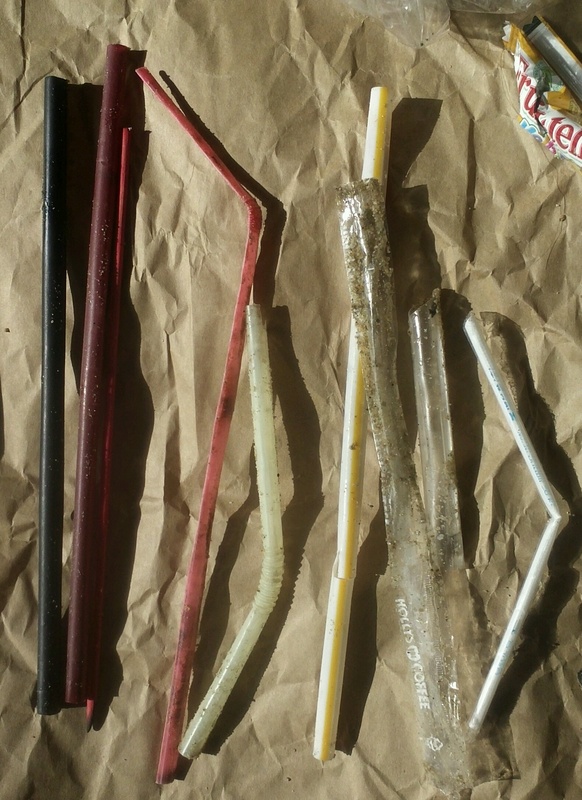 When I collect litter off of the beach a lot of the garbage is straws from drinks from the nearby cafes. Of course, be sure to bring your tumbler along with you in your purse or bag to avoid using plastic cups and lids with that straw. It doesn’t take me long to collect straws on my morning walks,. NO PLASTIC WATER BOTTLES This is an obvious one, especially with my previous post on the usefulness of tumblers, which is hyperlinked just above, but I’ll say something quick as a reminder. Plastic bottled water is as unnecessary as a straw, you don’t need ’em. They have become modern-day conveniences and the norm for most, but change your habit by buying a home use water filter, purchasing a metal water bottle or tumbler to be filled with the filter or even straight out of the tap if it’s safe to do where you live. Side note: Isn’t it sad that it is unsafe to drink from the tap! I was warned when I moved to Korea that it’s a big no-no. Most people create a lot of waste by buying large, plastic bottles of water. Water filter, couldn’t live without it. CHANGE YOUR PLASTIC USE HABITS This is incorporated into all of the tips above in a way, yet deserves more explanation. In order for me to cut back on my plastics use, I have to make small decisions every day. For example, there is a bakery around the corner from me that I enjoy, but I will not allow myself to go in there unless I have a container on me to carry the bread away with. At first they looked at me funny, but after about the fourth time, they gave me a day old bread free of charge (or service as they say here) because they may have thought it was cute that I brought my own Tupperware. Changing habits, whether it be stopping bad ones or starting good ones, takes time and effort and won’t happen overnight. It might seem, at first, like a big pain to have to cart around a metal water bottle with you everywhere you go and you might find yourself grimacing at the checkout line when you realize that you’ve left your reusable bags at home – AGAIN! If you keep at it and make little notes, place the bags near your car keys or always in your purse, then it will begin to be the way things are for you and you’ll be cutting your plastics use down bit by bit.